The article shows a few tips to calculate and display times that are greater than 24 hours, 60 minutes, 60 seconds. When subtracting or adding time in Excel, you may sometimes want to display the results as the total number of hours, minutes or seconds. The task is a lot easier than it may sound, and you will know the solution in a moment. Select the sell(s) you want to format. Right click the selected cells and then click Format Cells, or press Ctrl + 1. This will open the Format Cells dialog box. Below are a few other custom formats that can be used to display time intervals exceeding the length of the standard time units. 2 Hours & minutes 50 hours and 40 minutes [h] "hours and" mm "minutes"
3 Hours, minutes, seconds 50 h. 40 m. 30 s. [h] "h." mm "m." ss "s."
4 Minutes 3040 minutes [m] "minutes"
5 Minutes & seconds 3040 minutes and 30 seconds [m] "minutes and" ss "seconds"
6 Seconds 182430 seconds [s] "seconds"
Note. Although the above times look like text strings, they are still numeric values, since Excel number formats change only the visual representation but not the underlying values. So, you are free to add and subtract the formatted times as usual, reference them in your formulas and use in other calculations. Now that you know the general technique to display times greater than 24 hours in Excel, let me show you a couple more formulas suited for specific situations. To calculate the difference between two times in a specific time unit, use one of the following formulas. To calculate minutes between two times, subtract the start time from the end time, and then multiply the difference by 1440, which is the number of minutes in one day (24 hours*60 minutes). To get the number of seconds between two times, multiply the time difference by 86400, which is the number of seconds in one day (24 hours*60 minutes*60 seconds). For correct results, the formula cells should be formatted as General. If the end time is greater than the start time, the time difference is displayed as a negative number, like in row 5 in the screenshot above. To add a desired time interval to a given time, divide the number of hours, minutes, or seconds you want to add by the number of the corresponding unit in a day (24 hours, 1440 minutes, or 86400 seconds), and then add the quotient to the start time. Where N is the number of hours, minutes, or seconds you want to add. 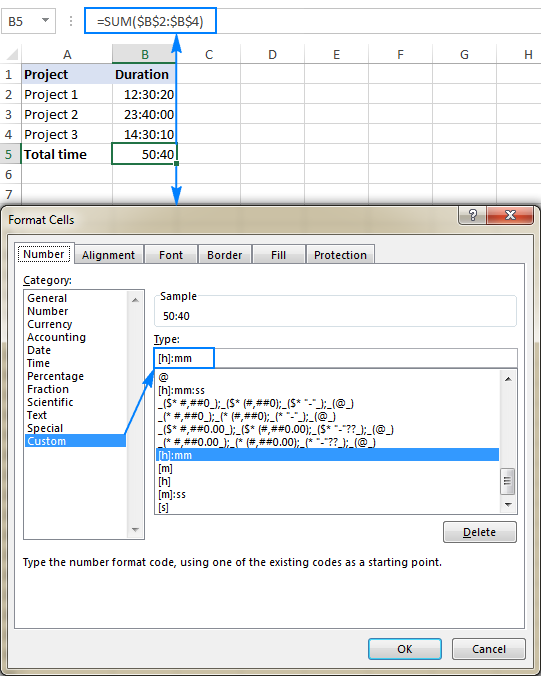 If a calculated time displays as a decimal number, apply a custom date/time format to the formula cells. If after applying custom formatting a cell displays #####, most likely the cell is not wide enough to display the date time value. To fix this, expand the column width either by double-clicking or dragging the right boundary of the column. This is how you can display, add and subtract lengthy time intervals in Excel. I thank you for reading and hope to see you on our blog next week! 32 Responses to "How to add & subtract time in Excel to show over 24 hours, 60 minutes, 60 seconds"
I believe you have an error in the section "How to add / subtract more than 24 hours, 60 minutes, 60 seconds". Hi Svetlana, This is very useful and very informative. I have some doubt if have time 12:30 and i apply formula as A2+(2/25) then it decreases the time by 5 Minutes and gives 14:25 time and if apply A2+(2/23) then it increases the time by 5 Minutes and gives 14:35. Could please give me clarity on this how does it calculate? I don't know the reasoning behind your calculations, but the results are correct. As you probably know, in internal Excel system, times are stored as decimal fractions, e.g. 00:00:00 is stored as 0.0 and 23:59:59 is stored as 0.99999. So, in terms of times, 2/25 (0.08) is 1:55, when added to 12:30, it gives you 14:25. For more information, please see Excel time format. How should i add running clock in excel? Hi, I need to take a monthly decimal total number of hours worked (i.e. 160.833333) and display as "X hours and Y minutes" which should be 160 hours and 50 minutes, where 49.998 minutes is rounded to the nearest whole minute. I am tearing my hair out. 2: 23: 43 (d: hh: mm) plus 30 minutes displays as 2: 24: 13 but it should be 3: 0: 13. What do I do to get the correct display? Say my start time is 18:00 hours today and my end time will be 12:00 hours next day. Then how to I calculate the total hours duration (hh:mm format) and also how to get it in decimal format for other calculations (may be y*24). I got my answer i.e. 24+(24*(endtime-starttime) = no. of hours difference. I hope I am right in this. I'm calculating staff OT for 5PM onward and just wanna show 30minute and above in the cell. Which function can be useful? I want to add 1 hour 30 minutes + 2 hour 50 min in XL sheet.please help me by the formula. When I was doing the formula to add how many hours working in hours:minutes, for example 1.17 one day and next day 0.59 total should be showing 2.26 but formula is showing 1.76. How to make a formula if anything over 60 minutes should become a hour? Thank you. I figured out how to sum times in Excel, and I've almost figured out how to merge them into a Word document. I say "almost" because Word doesn't seem to be able to handle summed times greater than 24 hours (I'm summing total hours worked). I've tried every "switch" I can think of, and once the hours:minutes (32:12) goes beyond 24 hours, it will not longer display properly. Is it possible to merge such information to Word and have them display as they display in Excel? (I've not tried using a DDE link because it seems that Microsoft is moving away from this so I didn't want to get attached to something that will be phased out). This isn't working for me. When the total hits 24 hours it starts over; adding time that totals 28:30 shows a total of 4:30. I am certain both the cells I am adding and the cell I am putting the total in are formatted as custom h:mm. I am using Excel on an Office 365 subscription; Excel for Mac, version 15.32. I searched all over youtube for a formula to show lapsed time from start time and couldn't find the answer. I knew there must be some simple formula, and you had it. Great directions, down to the important details. Many thanks, I took a couple hours trying to find the answer and in five minutes you showed me how. THANK YOU Svetlana for your help. Excel angel! i tried to minus =End date-Start date, but it shows me #value! anyway to solve this? I am trying to figure out how to add a remainder of time to a total. but if I enter more then 4 digit total running Hrs. cell show #VALUE! But if enter 5 digit show #VALUE!